To connect the community, enhance the quality of life, and improve the environment, by conserving and protecting natural resources, and providing recreational and wellness opportunities for all members of our diverse community. Before there was a DeKalb Park District, the park system in DeKalb was owned and operated by the City of DeKalb. 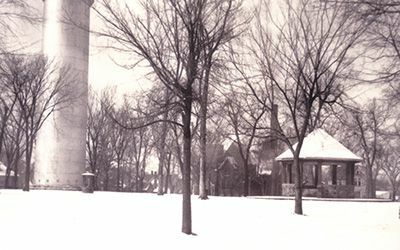 In 1935 the city owned four parks: Annie's Woods, named after Annie Glidden, the niece of barb wire inventor Joseph Glidden; Huntley Park, named after the first settlers of DeKalb, and designed to be the town square, housing the bandstand pictured above; Liberty Park, the site of the second bandstand and located on the near north side of DeKalb; and Hopkins Park, named in honor of Judge Hopkins, who donated this 32 acre tract of land which became the crown jewel of the system. In the early 1930's, the League of Women Voters fashioned the idea that DeKalb should have its own park district, just as neighboring Sycamore had had since 1923. According to historical accounts of the time, the advantages of the park district system were apparent to the League, with one of them being the ability that an elected park board could pursue its own goals, unimpeded by the goals of the city. Another advantage was that the park board could create board action bonds that could sustain needed capital improvements. 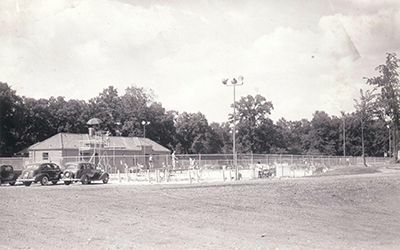 Thus, in 1935, the DeKalb Park District was born, with the first significant improvement project opened that summer being the new community swimming pool in Hopkins Park, and many other improvements to follow. The First 50 Years of the Park District As the DeKalb community grew, so did the DeKalb Park District. By 1960, the district had eight parks and by 1970 twelve. At first, the main services provided focused on swimming and use of the burgeoning park system. But as lifestyles changed, so did the district. In 1970, the park district hired its first full time executive director. And by 1980 the district had rebuilt the swimming pool, acquired Haish Gymnasium and a lovely nine hole golf course (Buena Vista), which was donated by the DeKalb Ag Foundation. In 1985, the park district purchased a second nine hole golf course (River Heights), which was developed into an 18 hole course over the next 10 years. More than just parks and facilities had changed. By 1983, the park district operated year round athletic and recreation programs. These programs included summer day camps, adult softball leagues, swimming lessons, golf lessons and many others. Winter programs included indoor swimming, adult basketball leagues, fitness classes to name a few. But lifestyles in DeKalb continued to demand more services and growth of the late 1980's and 1990's would force further expansion of the park system. By 1990, DeKalb was experiencing growth. New housing stock was created with subdivision development and with cooperation from the City of DeKalb in the planning process, new neighborhood parks were donated to the park district by developers. By 1992, 24 parks existed within the district and by 1998, 40 parks totaling over 700 acres. Many of these new parks had been acquired as conservation areas in order to preserve floodplain lands and wildlife habitat. Other parks were active recreation facilities designed to serve all types of recreational needs. Combining this system of parks with the Kishwaukee Kiwanis pathway system totaling 8 miles in length, connecting DeKalb with Sycamore and the Great Western Trail to the east, the DeKalb Park District at the turn of the century had come a long way in its first 65 years. Other facility improvements of the 1990's included creation of the Hopkins Park Community Center in 1989, which was a 10,000 square foot social and community center addition to the Hopkins Swimming Pool Facility. Hopkins Park Community Center Terrace Room serves as a setting for wedding receptions, parties and meetings. The second floor of the Community Center houses the DeKalb Park District administration offices. Similar to the manner in which the existing Hopkins Pool was expanded to a community center, in 1992 Haish Gymnasium was expanded. Acquired from the school district in the mid 1970's in exchange for the park land in order to build a new neighborhood school, Haish Gym was all that was salvageable from the old Haish School. Operated as a stand alone gymnasium for 15 years, a second gymnasium was added to the facility in order to accommodate the huge growth in indoor winter athletic programs. In January 2000, the indoor Sports and Recreation Center was opened. Adjacent to DeKalb High School, the center contains two additional gymnasiums, locker rooms, activity and dance rooms, as well as a full acre of open space under a 45 foot roof. This acre of open space is utilized as two parallel soccer fields, a football field or an indoor softball/baseball field, depending on how it is set up. This venture demonstrates how the DeKalb Park District has taken its place as one of the premier park districts in Illinois. Most recently in 2004, the DeKalb Park District opened the Nehring Center for Culture and Tourism in downtown DeKalb. Converted from an old bank, the Nehring Center holds the Chamber of Commerce, DeKalb CVB, Renew DeKalb, and Kiwanis International offices. On the second floor of the building is the Nehring Gallery. Over the years, a variety of exhibits have been displayed in the gallery working in conjunction with NIU. The gallery now serves as a permanent exhibit home to for the DeKalb Ag Alumni collection.